I really don't like Czech beef. I find most cuts extremely tough and lacking flavor. When we want quality in Prague, we usually go to El Barrio de Angel. They serve tender Argentinian beef cooked over a flame grill. Almost a year ago, I wrote about their great rib eye. El Barrio is a little cheaper and a lot less pretentious and hectic than La Casa Argentina where I had a fine steak and bad service a long while back. Anyway, I recently picked up a recommendation to try U bílé krávy. 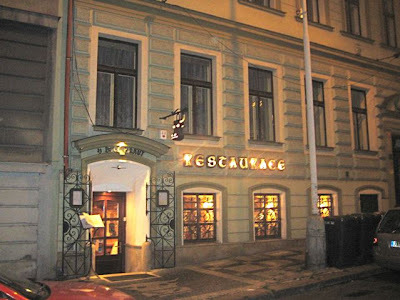 It's a modest little place with modest prices just behind the National Museum at the top of Wenceslas Square. 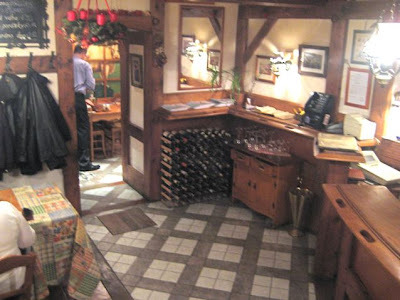 On my first visit, I walked down the stairs into the reasonably rustic restaurant. Just a couple of tables and a bar in the front room. There was a hallway and then another small room. I'd guesss there were around 10 or 12 tables altogether. 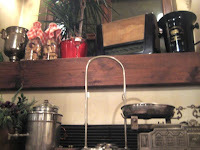 There was plenty of country kitsch decorating the dining area. The waiter brought fresh, sliced baguettes with butter mixed with red pepper. 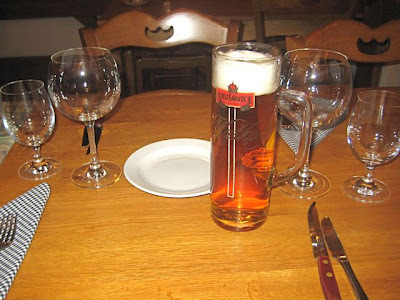 Be aware that there is a 30 CZK cover charge per person. The waiter was quite a character. He spoke very good English, but was somewhat abrupt. Then, V showed up after a few minutes, and his gruff exterior melted away. For the rest of the meal, he was all charm and humor. Very efficient. I started off with a beer. They have Krušovice Mušketýr on tap (38 CZK). Not my favorite, but this one was pretty good. The right temperature and carbonation. 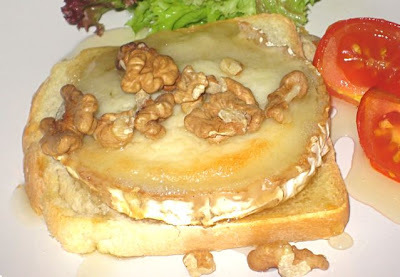 For an appetizer, I got the baked goat cheese with honey and walnuts (135 CZK). A little expensive, considering its simplicity and that it came on what I'd call Tesco toast. This bothered me at first, but overall, I have to admit I did enjoy it. The combination of warm, tangy cheese with honey made me forget issues like presentation and cheap white bread. And hey, goat cheese ain't cheap these days. 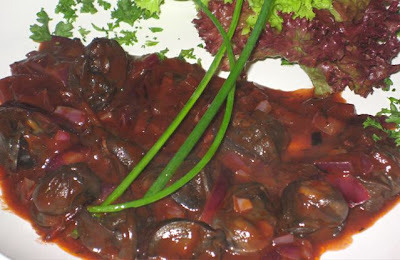 V ordered the escargot on red wine (168 CZK). There was a generous portion of snails. V said they were not her favorite, with a strong garden-like, earthy flavor. She did enjoy the sauce, which she said reminded her of coq au vin. At this point, I'll note that the Internet version of the menu, as of this writing, is out of date. Some of the prices were off by about 15 CZK. Also, the Internet menu listed sauces like demi-glace, which I love. But I asked the waiter, and it was no longer available. 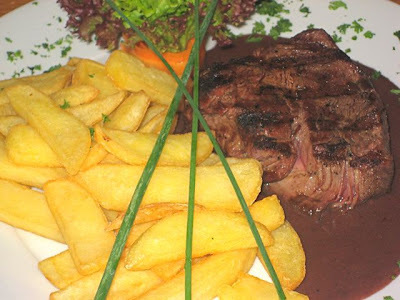 For a main course, I ordered the 200 gram Charolais filet (310 CZK) with a side of fries (45 CZK). I was hoping for real French-style frites, but they were just regular steak-fries like those you get at the supermarket. 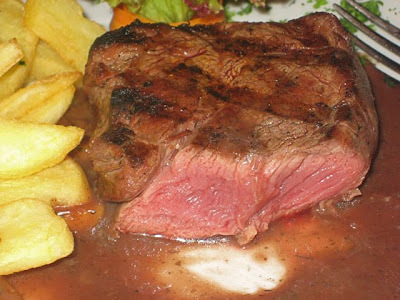 I asked for medium-rare, but I'd say it came out straight-up rare. The quality of the meat was excellent. I was surprised how tender it was. However, the flavor was lacking on a number of levels. I wished for more of a smokey taste from the grill. It needed salt. And it came with a one-dimensional, rather sour wine sauce. I came away from the meal feeling that there was potential. I wanted to try something different, hopefully better. So, I returned with two friends for another meal. The service the second time around was less efficient and less friendly. We had different, younger waiters. We had trouble getting their attention. I couldn't help but think that it would be better if V was with us. 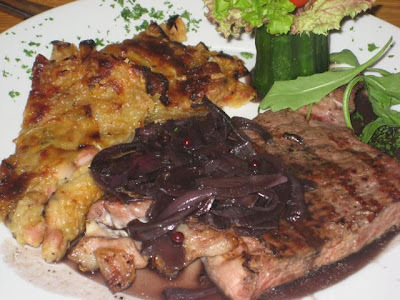 I ordered the Charolais entrecote with wine and shallots (270 CZK). On the side, I had the Lyonais onion cake 50 CZK). This steak was the opposite of my first. It had more flavor from the grill and the sauce was a little more subtle. However, the meat was also relatively tough. One side was lean and dense and hard to cut. The other side had more fat and more tasty and tender. I was unhappy to find that it was barely warm. The cheesy onion cake was dried out. It had a mealy texture. It had seen better days. And strangely, again, I still liked it. A freshly prepared one is probably even better. 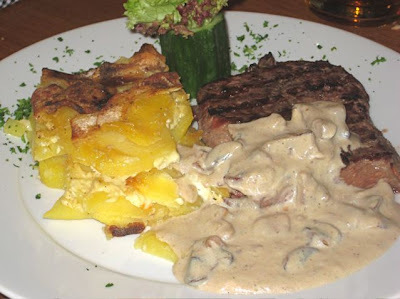 One of my comrades, the G-man, had the faux filet, also known as sirloin, with a mushroom cream sauce (275 CZK) and potatoes au gratin (55 CZK). I had a taste of his beef. It looked and tasted almost exactly the same as my entrecote. The mushroom sauce would have been good, except most of it was cold. 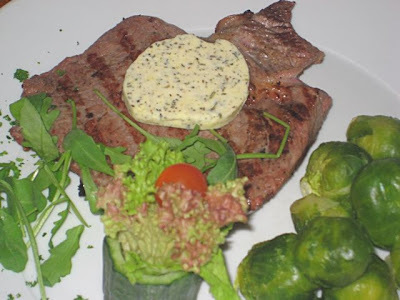 Dan the Man got the Steak Classic with herb butter (260 CZK) and Brussel sprouts (38 CZK). I did not try his. I asked him if he liked it. He gave a half-shrug. Dan is a man who, unlike me, doesn't get deeply expressive about food. But I've known him for years, and I understand his non-verbal communication fairly well. Translation: "Whatever. Nothing special. Leave me alone." I had high hopes for this restaurant. 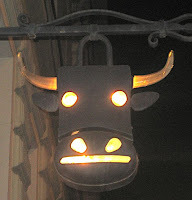 I'd heard they had some of the best steaks in Prague. To be fair, people have different expectations, as well as different experiences on any given night. But my expectations had me dreaming of savoring this great hidden spot just a few step behind the National Museum with steaks for less than 300 CZK. Alas, that was just a dream. For me, U bílé krávy could have been so much better with more attention in the kitchen on preparation, presentation, and flavor. It did not make the cut, so to speak, for a return visit. If you want to get a good steak dinner there, I have a feeling that, like Cloquet, you are going to hate reality. Have you been to U Kasparka or to the Bila vrana? None of those are specialized steak restaurants, but I still had some good beef in them. Avoid the mexican-like stuff U Kasparka, though ;). I haven't. But they sound good -- with good prices. I enjoy u bile kravy; an old standby. I have given up on ordering anything other than fillet at most places in Prague and this one is particularly tender and cheaper than most steak places' fillets. What I don't like about this place is that it's very small; make sure you reserve. I second Bila Vrana (haven't yet been to U Kasparka) although the service there can be glacially slow, if quite pleasant when it is offered. Not as (even close to as) good as u bile vrany though IMHO. Definitely go for Kasparek. As far as I am concerned the baked cream potatoes with leeks are legendary. Never figured them out to make myself though, they're just not the same :-(. Something of a comfort food for me. Pork sirloins are also highly recommended. I notice that you mention the Aberdeen Angus restaurant in a previous post, although I don't get the impression that you ate there. I have only eaten at their Plzen branch - it's a haven in a culinary desert - and must say that they have the best steak I have ever had anywhere. 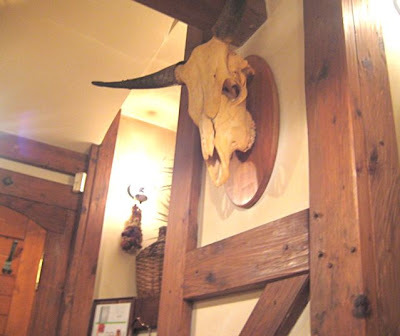 Their meat is organic from Sumava and while they are not cheap, I would heartily recommend them (despite their rubbish name which is in no way connected to the dire London chain restaurant). I think the Angus restaurant at the Palladium closed down. es, it closed down and re-opened again in the Millenium Plaza in Celnice.. I tried their Burger today and even though it was wrapped in Baguette instead of a bun, I would recommend it.. 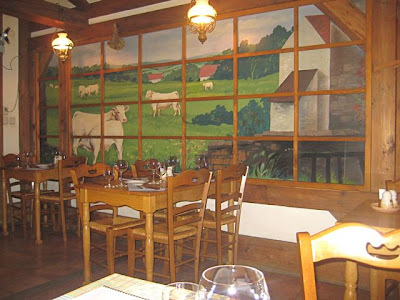 I think the best steaks are at the Family Hotel Okor in the charming village of Okor, northwest of Prague. The steak is fantastic. The atmosphere extremely pleasant. 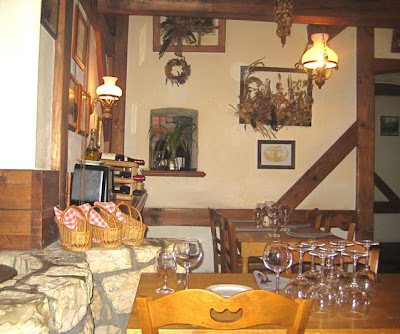 The inn is like a little slice of France in the Czech countryside. And the prices are reasonable, under 300 kc for a filet. You just have to drive out to Okor to enjoy it, that's all.